A friend of mine and brother in Christ for over 30 years made me promise that my next post would be on this subject. My Brother, I heard you, you are in my prayers, stay faithful, know the Lord is with you, and be blessed! 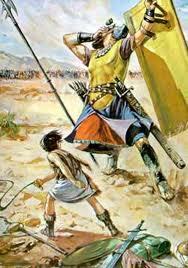 Most of us know the story of David and Goliath but some do not know how David got to the place where Goliath was. Jesse, David’s father, asked David to go the Valley of Elah to see how his brothers were (they were fighting the Philistines with King Saul and the Israelites) and to come back and tell him how they were. A couple of weeks ago, I called a new brother who has come to our church who is going through a very tough time to see how he was making out. I checked for him because days earlier he reached out to me at a desperate time when he had a bottle of tequila in one hand and the Bible in the other. (I convinced him not to drink the tequila). I just wanted to make sure he was okay. Later that week in our Growth group he thanked me for checking on him (which is when he told me he didn’t drink the tequila) and he let me know how much it meant to him that I checked on him. It didn’t cost me anything except my time. I was thankful I called when I thought of it and didn’t say “I’ll call later” or “Let me just do this thing first”. That same night is when I was led to call my childhood friend. We had not spoke in a few months and before that it was years. We reconnected and I vowed to stay in touch. That night I called to check on him, he told me how much he appreciated me checking for him and he let me know how important it was to do that and how I took him out of a very dark place at a very bad time. That is when he told me the story of David and made me promise to write this. We may never know how far a small, kind, thoughtful gesture can go. It may be a smile, holding a door open for someone, saying “bless you!” when someone sneezes, that can make a big difference in someones life. Just to know that someone cares and was thinking of them. It’s that ripple effect, that pay it forward thing, that has far reaching effects. Or just the warming of someone’s heart at just the right time. It’s no coincidence when you get that “I was just thinking of you” moment. The Holy Spirit whispers to us sometimes to do his work. If we are on the right path or in the right frame of mind we can hear and act on His influence. I pray that I don’t miss those opportunities to be used for His will. Friends stay open, stay connected to God so He can use you to make a difference to someone who really needs it at the time. You may just slay the Goliath in someone’s life at the time. You can win the battle for them, simply because you checked for them. Until later, I’m just tryingtobeamanofgod…Blessings!